I find the expansion to various roles most interesting. Does that mean that in addition to the fighter (F,S, presumably G, too), reconnaissance aircraft (RVF-25), and unmanned fighter squadron command craft (presumably the RVF-25 with some modifications), there's also an attacker (like the VA-3) and fighter bomber (like the VB-3000) models? Intersting. Maybe the tornado or armored pack is already enough to fulfill those roles? All i can think about this fold wave system is wireless energy transfer. I wouldn't surprise if the energy supply came from fold space. Like xenogears. Possibly for the Tornado pack. The armoured pack is a totally different specification. I wouldn't surprise if the energy supply came from fold space. Like xenogears. This makes sense, especially considering how ISC uses, if I'm not mistaken, the super dimension as a place to temporarily store inertia. Thanks to the "Official Complete Book: Macross F Theatrical Edition: the Wings of Goodbye", I was able to locate the specific Newtype issue that the YF-25 Prophecy article appeared in. Fast forward a few months of searching through local Bookoffs... et voila! Some of the stuff penned by Kawamori is best guess. As my wife has said, he doesn't have the easiest-to-read handwriting. What I found most interesting is the appearance of Isamu Dyson. Still at Eden! Albeit retired. Great that the 2 Macross F movies (or at least their backstory) flesh out other parts of the Macross universe, too. IIRC they even promoted him to Major before he retired and joined a certain other organization. He was chief test pilot for that program. At least one other was killed and another injured. Current project: finding and translating info on the VF-1X. ... also `corrected the English text at the front of the book, and some other odd translations. Not going to do the other part on the VF-1 in the tail end of the book at this time, as it is basically about the origins of the VF-1, and the standard specification VF-1. Which we've already got oodles of translations of. ... alas, the information is more geared toward game play, then in-universe stats. Nevertheless, it does add some stuff of interest when it compares the VF-1 to the other VFs. The ability graph also is an interesting dynamic - in comparison to the other VFs. The F/A-18 not only replaced the Fighter compliment on CVS' but also their Attack craft as well with it multi-function. On Emigration fleets with limited resources, a similar extension of a new generation VF's duties would be equally reasonable. last on the VF-1X+ (in my collection at least. Note: checked the booklets that come w/ both MDM:VF-X & M:VF-X2, and natta on the VF-1X+). Plus some spot translations of the intro (it was most interesting to compare the differences in the English and Japanese text in the book), as well as speed, turning performance and so on. This later one is noteworthy for giving at least an impression of the relative throttle settings between the VFs that appear in the game. I'm fairly certain that lifting bodies and other aerodynamic features that increase lift (thereby allowing for a lower flight speed) are not taken into consideration. Nevertheless, it provides a place to start the conversation on throttle settings. The main "goal" was the VF-19 that appeared in the 2nd movie. However, that turned out to be less about the VF-19 per se, but Isamu Dyson's fate, post Macross Plus. Did some other spot translations of titles, etc., to give a sense of the content. The most interesting was Kawamori's comment on the possibility of a sequel. Also... did anyone spot Tetsuwan Atom (Mighty Atom, Astro Boy) appear in the movie???!??!??! Yeah...it caused quite a stir at the time. The Unified Government Chief of Staff Rescue Operation is also enlightening. I think that description itself formed the basis of M3. ... 2028 being the same year as the VF-11's first flight. Oh! Thanks for the link. As a result, in order to deal with this,two kinds of GERWALK form were set up; one for high-speed combat, and the other for hand-to-hand combat. 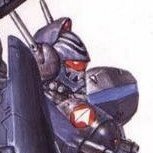 How many years of 'net arguements have there been about the VF-17 not having a standard looking GERWALK form... when all along, it's been sitting there, in print, since 1995.03.01?!?!?!?! Yay! Was actually just going to send you a remnder about this, Sketchley, but then saw your post. Working through it this week... and just like the VF-11, I'm surprised at how much the VF-17 doesn't talk about the VF-17. A big chunk of the intro is dedicated to General Galaxy, the VF-14, and mention of the GG light fighters in passing! ... and AKA, the Stealth Valkyrie. Random thoughts: I like this and the 11's write-up, as not only do they provide some fine details on the two craft, they also paint in, albeit with large brush strokes, some of the background of Macross. Not only do we get production companies and a bit on their histories, but we get the same for the Unified Forces AND bits on in-Universe publications AND attitudes of in-universe aviation fans. Great stuff. So only 718 VF-17 produced in total. Quite a small number. Considering the number of colonies and colony fleets, that does seem kinda small. Yes, and Macross Chronicle repeats the information. 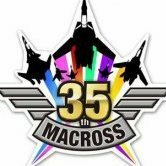 That said, one nagging question the publications don't clear up is: is that only the total number produced AS OF the events of Macross Plus? The article does vaguely state that the VF-17T model is continuing to be produced (it's not clear if that's only during the development from the VF-17A through to the VF-17D, or above and beyond that). The other angle to consider is official produced (basically during the production run), and produced afterwards. An example of this is the VF-1X++ produced in 2047: they're not counted. Of course, it's implied that the VF-17 has a high or extremely high operating cost, and beyond special forces, it's not worth procuring more than the 4 that Macross 7 implies are standard for emigrant fleets and planets (that's 2x D model, 1x S model, 1x T model (later converted to the VF-17T Kai). Fuzzy math gives us approximately a deployment of 175 different places (if each place receives 4 fighters, total). Erm... you do realize that "This is Animation Special: Macross Plus" was published in 1995, right? So if this info was originally from the Animation Special Macross Plus, I'd be more inclined to believe that they meant that it was the total number of VF-17s thus far. There are no legal reasons for not using the VF-19. Big West owns the character and Frontier is a Big West show. HOWEVER, with the introduction of the VF-19 and VF-22, impressions are that the reasons to continue producing and utilizing the VF-17 get fewer and fewer. This *may* be the reason why GG revises the base aircraft and starts producing the VF-171. Completed the VF Series Development Chronology in "Macross Digital Mission VF-X: Flight Manual"
Aside from providing general dates of milestones for a host of VFs, it also provides an exceedingly rare bit of info on the VF-2, 3 and 5! ... continuing the discussion on the VF-17: given that the bar is still very dark at 2040 (when the chronology stops), implications are that the VF-17 continued to be mass produced. I'd say that the Macross 7 fleet (and other fleets) must have likely had more than 4 x VF-17. These extras would be needed to cover conversion training from VF-11C to VF-17, spare VF-17s if some are down for maintenance and also attrition replacements for those VF-17s lost in accidents or combat. Even though the Macross 7 fleet likely has the ability to build replacements VF-17s to cover combat losses, that would take time, so at least a small quantity of spare VF-17s would likley be held in reserve. We start the Macross 7 series seeing 2 x VF-17D and 1 x VF-17S. Physica takes over Dockers VF-17D after Docker is incapacitated, but then Physica's VF-17D is later destroyed. So there must have been at least 1 spare VF-17D held in reserve. Milia pilots a VF-17S in episode 21, which is painted red, but it is unclear if this is Kinryu's old VF-17S or another spare VF-17S. So I'd say that the Macross 7 fleet probably had 1 x VF-17S and 2 x VF-17D on active duty, probably a similar quantity held in reserve (or at least 1 x VF-17S and 1 x VF-17D) and a VF-17T for training duty to convert a cadre of the best VF-11C pilots as reserve/replacement pilots for Diamond force to replace casualties. I personally doubt the the VF-17T trainer was converted and given to Sound Force. More likely the VF-17TKai was purpose-built for Sound Force (please let me know if any source material contradicts this). 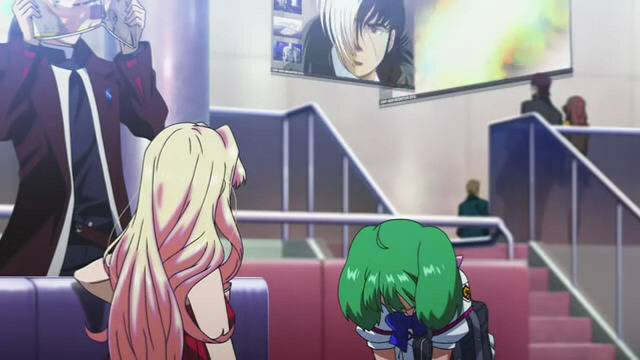 I like how it rounds out the Macross universe a little bit more. The stuff about micronized Zentraadi pilots disliking Regaado in targeting sights on their VFs is fun. Nevertheless, some parts have to be taken with a grain of salt. Even though the stuff on the VA-3 strongly implies that those squadrons were flying the VA-3 during SWI, I think it's a safe bet to say that they were flying VF-1, in the VA role during that war. Also, despite the book not directly stating it, I'm fairly certain that the VT-25 VF-17 colours are one and the same as the VF-17 that can be seen in the Macross Plus movie. Oh... Graham, I found the stuff on the VF-17 squadrons interesting. I hope you do, too. Yes, they are. You can even see the tail markings. The VF-17Ts aren't the only 17s in the movie though, there are a few single-seaters in the color scheme we see in 7 there too.